Standard Shipping &lpar;ground service&rpar; is used to ship items that are considered hazardous. Delivery is only applicable within the contiguous United States. Additional shipping fees may apply. Signature required for receipt of shipment. Two great handhelds at a value price! 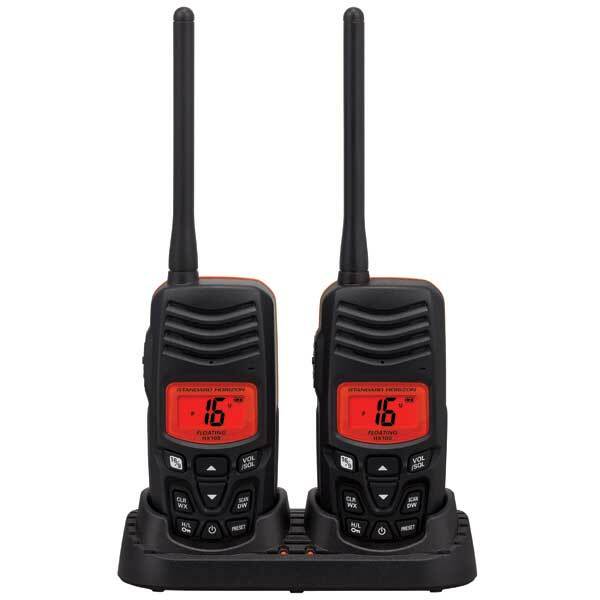 The floating HX100 Twin Pack has it all, a slim, form-fitting case design, oversized easy to read LCD and backlit keypad. The HX100 looks and feels great at a fraction of the cost of comparable VHF radios and gives you a full day’s worth of operating time. Other great features include Programmable Scan, Dual Watch, Channel 16 Priority Scan, NOAA weather channels with weather alert, selectable 2.5 and 1 Watt transmit power, and a battery life indicator. The HX100s are value-packaged with 700mAh non-memory rechargeable batteries, belt clips, 110 VAC trickle charger and a drop-in charging cradle capable of charging both radios at the same time.